Can you believe there are only three weeks left until we reach Christmas? Insanity. Anyway, I’m guessing a lot of you did some serious holiday shopping and picked out presents for your family and friends this weekend, what with all the sales going on. However, for those of you still working on those hard-to-pick-for people, be sure to check out my gift guides! So far I’ve created massive present picks for the ladies, the gentlemen and the kiddos, and this coming Saturday I’ll be doing a gift guide for fab finds under $100! I hope you didn’t miss this present pick either – it’s a good one. Williams-Sonoma is extending their amazing sale another day – thank goodness, because I’m not really sure how I missed it yesterday! Enjoy 10% off a $50 purchase, 15% off a $100 purchase, 20% off a $200 purchase, or 25% off a $500 purchase when you use code SAVENOW at checkout! I’m dying to pick up one of these colorful KitchenAid mixers (maybe this one?) and some gorgeous copper cookware. You can also save on a bunch of festive holiday gear like these tartan mugs. Click here to shop the sale! Don’t forget about the NET-A-PORTER sale! It’s still going on and you can’t miss it. A few more items for you to peruse include this Valentino bag (the color scheme is amaze! ), this Ek Thongprasert necklace, and this giant bow-adorned skirt. I would personally love to have this Missoni shift for spring! Great picks #10 is amazing. I just love those Prada sunnies – the color is so beautiful! and That denim dress is adorable! This Net-a-Porter sale is killing me! That Max Mara jacket, be still my heart! The dress with #4 shoes would be a cute spring outfit! I LOVE those drop earrings!! I’ve been debating on purchasing a pair of Oscar de la Renta earrings, this pair is glorious. Like the denim dress too. Great picks! those earrings are so awesome! great picks! SO many amazing things here Merritt! I want it all! Such great pics! That eye shadow is on my wishlist! I love those cap toe sneakers! Loving the blue and gray color palette here! That bag is gorgeous! 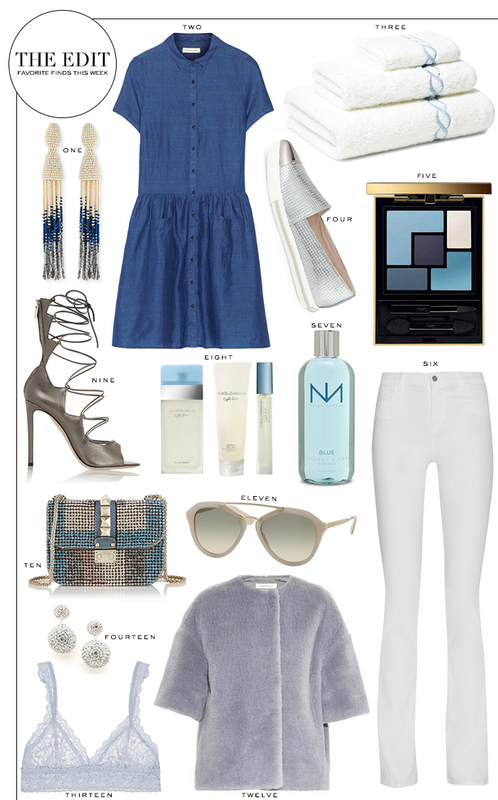 What a great selection of items, I love the pale blues. Those Matouk towels on One Kings Lane were a great find, Matouk is one of my favorites for linens. Ohh I am need some good gifts for some kiddos, will have to head over and check out your gift guide.